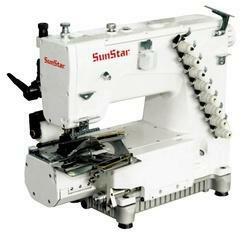 With the greatest quality and technology, SunStar leads the sewing and embroidery machine industry. 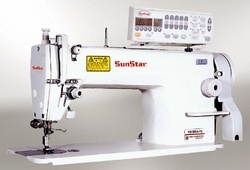 SunStar takes the initiative in establishing high standards and leading the sewing and embroidery machine market in the upcoming future. 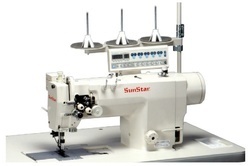 SunStar maximizes Customer Satisfaction with products that our customers always have been dreaming. 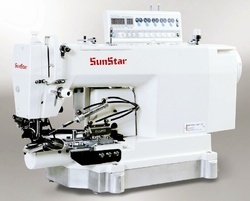 SunStar attained its worldwide customers with its leading technology, high quality and reasonable price. SunStar’s products establish comfortable work environment with low noise and vibration. They realize fast, stable sewing speed, and elegant sewing work. 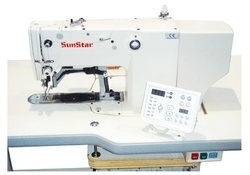 Our SunStar embroidery machines are exported to 150 countries in the world with No. 1 share in overseas market as well as within Korea. In addition to the outstanding production capability, our after service is upgraded to 24 hour response service system and is being the main reason why customers are choosing our products. We are gaining more reputation from markets with high performances, high quality professional product configuration. The world’s first large pattern sewing machine enabled revolutionary improvement in productivity. Also, the products provide total solution according to customers’ demands with items such as jean, air bag, car seat, embroidery and etc. 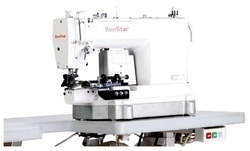 SunStar’s sewing machines and embroidery machines are integrated with high-tech services that already exceeded local standards, and are competing with world leading products in their excellence and technology. 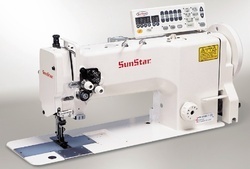 SunStar will lead customer satisfaction with sewing machines and embroidery machines that will meet customers’ expectations through higher innovation and advances in technology. With the adoption of the belt loop only presser foot, the series enable the efficient arrangement of the sewing materials. This delivers easy and convenient working environment and thereby contributes to improving work efficiency and productivity. By lightening the control box, the working space under the table has been expanded. The simply designed operation box, various functions, including pattern change, speed change, zoom-in/-out, and bobbin counter setup, are displayed in the icon forms, so that all the functions can be used by touching the icon once. Up to 26 patterns can be registered in the memory. There are two function keys, which can combine up to 30 registered patterns. This function enables fast operation. The CF card enables a large number of patterns to be stored. Thanks to the adoption of the solenoid-based thread release mechanism, it is possible to control the length of the remaining upper thread on the needle after trimming. As such, thread escape and sewing skip in case of the initial sewing can be prevented. By using the attachment appropriate for reinforcing stitches, sewing work has become easier, enhancing work productivity and efficiency. The adoption of the anti-abrasion trimming devices for super heavy materials has strengthened product durability. It has the maximum speed of 3,200spm, and the direct-motor method enables users to feel less fatigued. SunStar’s Direct Drive AC Servo Motor directly sends power to the upper shaft. This optimal design minimizes energy loss. Compared with existing AC Servo motors, it consumes much less energy. Controlling stitch movement by a micro unit(0.05mm), you can get an accurate sewing results and the best quality. 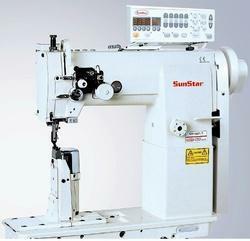 With 40mmx30mm Sewing area, the machine can provide a various sewing pattern. The motor adopts step control movement. trochoid pump, the major driving part for heavy materials has enhanced durability. 1) ’Band folder’ attachment in consideration of user's work efficiency. (2) Skip stitch function which enables convenient band finish work with oneneedle lock stitch by skipping initial waist band sewing and final stitch entanglement. 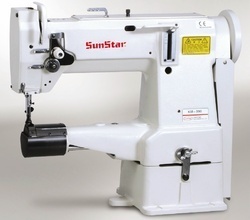 Equipped with the SunStar's 550W AC Servo Motor, the machine has reduced noises and vibration. The smooth and prompt response of the machine can render high quality seaming. The thread control mechanism improved the working ability. Needle width(gauge) - 1”(25.4mm) up to 2.5”(63.5mm) by needle space intervals of 1.4”(6.35mm) as basic option gauge set, it is able to make the various size of waist banding possible. 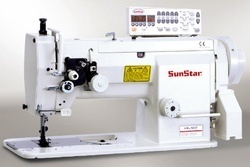 The sewing machine equipped with the sunstar’s 550W AC servo motor has realized less noise and vibration. The tropchoid pump-based automatic Iubrication mechanism improved the durability of the main driving parts to be required for heavy materials. SunStar's direct drive AC servo motor delivers power directly to the upper shaft. This minimizes energy loss and dramatically reduces power consumption compared with existing AC servo motor. The hand pulley attached to the direct drive motor makes maintenance work easier. Since the V-belt is not needed any more, even during high-speed sewing, the machine does not produce noises and vibrations linked to the belt. There is no worry about sewing material pollution due to the V-belt dust and the belt slip caused by long time use. and smooth response are delivering productivity enhancement. With 2800spm of sewing speed, feed and sewing of a loop can be completed within 1.2 seconds. This offers the highest productivity. 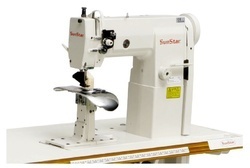 Equipped with 550W AC Servo Motor, the sewing machine can powerfully handle heavy Materials. The pneumatic trimming system secures stable and accurate trimming mechanism. The figures are marked on the adjusting part, so that user can conveniently conduct adjusting and setting of the sewing machine. The push button on the bed could rotate the pulley and easily adjust the fabric feed. The pneumatic presser-based up-down method has improved convenience of work. The broader contact with the sewing material reduces the occurrence of puckering. This could enhance sewing quality. Direct drive operation with the adoption of direct drive method, the M/C's response and the accuracy of stop position have been improved. It is optimal for high-quality sewing work. Since the large rotary hook is used, the bobbin exchange is minimized while productivity is improved accordingly. Automatic open/close is possible thanks to the installed pneumatic presser lifting & hemming device. It makes the setting for the lower end of trousers easy. The pneumatic cylinder can be opened or closed in the middle of work using the foot pedal. This has enhanced work efficiency. The trouser hemming process can be directly checked by this device. It makes sewing process easier and minimizes bad sewing. It enhances productivity as well. Flat bed-type SF 7400 series are designed to support repeat work such as towel and belt chain. Since it is equipped with various devices and attachments such as pulley, binder, and hemming guide, high productivity is guaranteed. The appearance is simplified thanks to embedding the position detector inside the pulley. User can create belt chains using the repeat work by easy installing the belt chain attachment to front cover. 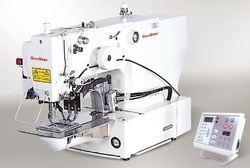 Model KM-2300U has a broader working space compared with the existing belt-driven sewing machines. It handles large sewing materials in convenient manner. The optimized design based on the 3D-CAD & CAE interpretation has realized less noise and vibration. The enhanced accuracy of stop motion and the smooth response have increased productivity. The high trimming quality and the adjustable rotary trimming in line with thickness are offered. The remaining thread is minimal. 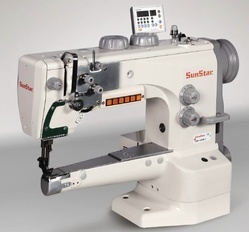 Sunstar, SPS/E-BH6100 series, which will lead the 21st century automatic sewing system with the best reliability! With compared with former BH6000, we reduced 30% of vibration at 2,200rpm and 10% of noise by improvement of structure and duration, it cause better working environment. The clamp structure which was moved independently by air cylinder guarantee stable sewing quality by sewing material fixed firmly with clamp regardless of the different thickness of sewing material. A hermetically sealed oil tanks helps a lubrication to hook. Controlling stitch movement by a micro unit(0.05mm), you get a accurate sewing results and the best quality. Various functions can be used by pressing icons, and the setting can be done with onetouch operation. As such, even the first-time users can easily operate the machine. As a seamless rack type, fewer breakdowns occur, and maintenance becomes eaiser. depending on button shapes. It has the most optimized structure in the world for the sewing work requiring frequent button change. restrictions of button size for using different sizes of buttons. The 3-layer button sorting device is installed on the button container. In any circumstances, buttons can be sorted out. Compared with competitors, more stable motor capability is offered (patent filing under way) based on 3-D CAD & CAE interpretation, it produces less noises and low vibration. The sewing machine can make accurate stop, and its prompt and smooth responsiveness leads to productivity enhancement. By emergency stop switch on the head,it is possible to stop the machine quickly in emergency situation. Through adoption of transparent safety plate on the head, the machine can secure the safety sewing working without any inconvenience. It is easy to replace bobbin thread by bobbin winder which was placed in perfect position. The oil window on the sewing machine makes it easy to find out the oil resupply timing. Compact design: Even the inexperienced user can use the sewing machine without many problems with the easy-to-use design. move during the machine operation. Definition adjustment: The definition of the screen can be adjusted by user with a dial. The double sewing: It is possible to perform the double sewing by easy operation, it can make stale and firm button hole shape. 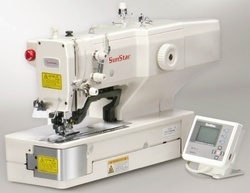 Direct drive, electronically controlled, lock stitch, button hole sewing machine series developed through the advanced technology of SunStar. Well-balanced seams can be achieved by using the standard machine capable of making button holes on knit materials with stability and speed. The speedy and precise operation of cutters employing a smart solenoid helps make up perfect button holes andincrease productivity. Since the machines form a variety of button holes using an electronically controlled mechanism that does not need the replacement of clutches or cams, they are excellent at small-quantity production of multiple products and thus ensure high productivity. Smaller & lighter control box : It is 30% smaller and 50% lighter than the previous control box, so that the space under the sewing table is dramatically expanded. Easy breakdown recognition : When machine errors occur, the LED lamp blinks to help users easily pinpoint and check problematic areas. Rack Type Design : With wireless rack-type structure, it is highly durable, reduces heat generation, and supports easy A/S service. The lower height of the machine improves the user°Øs safety during operation and enables to maintain easily. Since the table is not that high, the sewing materials can be securely placed on the table, thereby enhancing work efficiency. Since mechanical clutches and cam replacement are unnecessary, noises caused byv mechanical parts could be minimized. The X-Y transfer and thread bar structures are applied with electronic control methods. Consequently, It minimizes noises. The simplified mechanical structure ensures easier maintenance. The sewing machine is supported by gas spring, so that lifting it up or pulling it down takes no physical strength. When the machine is lifted, the sensor is automatically activated preventing accidental operation. Without replacing cutter and hammer, this makes it possible to sew eyelet button holes and direct button holes. This transfers sewing material automatically to sew button holes successively at regular intervals. This holds upper thread stably while sewing, which would enhance accuracy and quality. accurately and smoothly controlled. They contribute to making stable and beautiful eyelet button holes. Right and left press plates are individually controlled by separate air cylinder, so that the sewing materials with uneven thickness could be tightly fixed, guaranteeing sewing stability and high quality. UWith the max. sewing speed at 2,200 spm, this sewing machine delivers high productivity. All types of working motions were thoroughly analyzed and reflected for optimized machine operation. As a result, it could produce best quality sewing products, responding to all possible working conditions for eyelet button holes. UEyelet buttonholes can be made on different types of fabrics in a speedy and stable manner. Stable stitch types can be made. UHaving adopted the electronic control mechanism, which makes clutch devices and cam replacement unnecessary, it creates a variety of eyelet button holes. It stands out in making various types of button holes in small volume with elevated productivity. Since we adopted automatic lubrication system, the durability of sewing machine and high-speed stitching are secured. Wider working space leads to productivity elevation. The wiper driven by electronic solenoid is a device which makes the surfaces of fabrics beautiful in a next work. And On/Off is selectable simply by selecting the parameter. It maintains remaining thread regularly required for sewing of the first stitch regardless of thread type after thread trimming. Therefore it provides stable condition for sewing of first stitch and improves productivity by reducing defective proportion. In the simply designed operation box, various functions, including pattern change, speed change, zoom-in/-out, and bobbin counter setup, are displayed in the icon forms, so that all the functions can be used by touching the icon once. plates freely and making the plates turn into the integrated type drive freely by selecting a parameter. By lightening the control box, the workingspace under the table has been expanded. The power on/off LED enables fast checking of the causes of troubles and A/S services. This machine accomplished the best sewing area(50mmX40mm) for shaping, label attachment, safety belt sewing and complementary. Stable and beautiful stitches are realized through the adoption of advanced seam mechanism and installation of highly reliable shuttle hook. By excellent X-Y motion control system, you can get a smooth and accurate sewing results. Also this model gives a good quality for such sections as bias or spline. 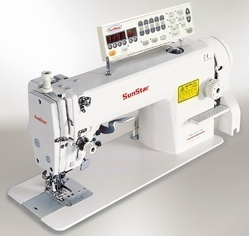 Cutting edge sewing technology is grafted on SPS/D-M7500G series, providing innovation features! TUsers enable to change setting on the machine by touch panel and inexperienced worker can control the machine easily. Oil free structure is applied for needle bar part, preventing sewing materials from oil stain. Fine-tuning of lubrication for hook is excellent for cutting oil consumption and working environment. Transferring system by gear, timing belt and rail provides accuracy and it is also convenient for making jig. SAlternative sensing option provided. Sensing by sensor can indentify 256 jigs and Sensing by barcode can identify 999 jigs. Trimming by air cylinder is stable and lowers breakdown rate. Structure of trimming knife, thread cover and hook holder enables to replace them in front of machine and it is also easy to maintain. For general materials: zigzag stitching for underwear, clothes, and trousers. For heavy materials: zigzag stitching for shoes, gloves, and bags. The zigzag sewing of various forms including 2-point, 3-point, and 4-point is possible with the simple cam replacement (optional). The vertical rotary large hook (x2 capacity) has lengthened the bobbin replacement cycle, thereby improving productivity. Various functions can be used by pressing icons, and the setting can be done with one touch operation. As such, even the first-time users can easily operate the machine. Up to 26 patterns can be registered in the memory. There are two function keys, which can combine up to 30 registered patterns. This function enables fast operation. The USB memory enables a large number of patterns to be stored. With full cross control, the X-Y feed can be adjusted at the unit of 0.05mm. This enables precise and delicate sewing, and consequently it can produce the better sewing stitch at difficult slant lines and curves. Durable and Stable Clamp Structure can support the sewing materials in a stable manner and helps to produce good-quality sewing outcome. According to the thickness of sewing materials, the presser foot height can be adjusted, and high-quality sewing is guaranteed for sewing materials whose thickness is different. SunStar’s direct drive AC servo motor directly sends power to the upper shaft. This optimal design minimizes energy loss. Compared with existing AC Servo motors, it consumes much less energy. With the maximum speed of 2700spm(Heavy materials 2,000spm), it has an outstanding productivity. The use of the motor direct drive brings about the pleasant working environment and reduces the worker's fatigue. The installation of Fortuna IV 550W(Heavy materials 750W) guarantees high needle penetration, so that the machine has sufficient power to handle heavy materials sewing. When machine errors occur, the LED lamp blinks to help users easily pinpoint and check problematic areas. · Various functions can be used by pressing icons, and the setting can be done with one touch operation. As such, even the first-time users can easily operate the machine. · Up to 999(Max. 30,000 stitches) patterns can be saved in the memory and chain function can combine up to 26 registered patterns. This function enables fast operation. · Beginners can use the machine by applying touch screen feature and icons. · By expanding pattern designs, the exact pattern design is available. The X-Y feed can be adjusted at the unit of 0.05mm. This enables precise and delicate sewing, and consequently it can produce the better sewing stitch at difficult slant lines and curves. Upper thread holder provides constant remaining thread length after trimming . by selecting practical embroidery mechanism. Skiving knife-grinding device is mounted. The switch manipulation just runs or stops the knife-grinding device. 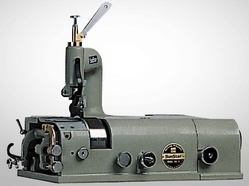 The highest record among the sewing machines of similar grade. Max lifting volume of presser foot is up to 14mm. In order to smoothly perform the maximum sewing speed of 5,500spm (common speed is 5,000), it adopts a high-quality aluminum thread take-up level. With the use of highperformance impeller pump, the durability of sewing machine on the internal moving parts was increased. Compact-type auto knee lifter with solenoid attached directly to the machine head on the back minimize loss of power. It is connected and disconnected easily. It also can make the better operation by providing enough space in bottom area of table (Option). remaining thread among similar types of machine. for the low-tension sewing minimized puckering and realize the elegant sewing results with the excellent straight sewing quality. 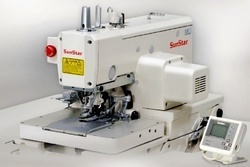 High speed, 1-needle, lock stitch sewing machine with automatic thread trimmer series developed through the advanced technology of sunstar. function.The various functions were created for operational convenience. This new product will greatly contribute to high quality of sewing pattern and enhancement of productivity. The pneumatic cylinder can be opened or closed in the middle of work in using the foot pedal. This has enhanced work efficiency. The trouser hemming process can be directly checked by this device. It makes sewing process easy and minimizes inferior sewing. It enhances productivity as well. It enables automatic open /close motion. With the device, the leg end setting of trousers is controlled easy. 2-fold rotary hook minimizes the replacement cycle of a bobbin. It leads to productivity enhancement. The machine has strong up-feeding drive especially for one-time sewing from general materials to ultra heavy ones. Simple & easy control mechanism of stitch length & reverse sewing function. It realizes excellent working for round-type sewing by its cylinder-type bed structure, and enable us to choose the type of cylinder bed according to the size of sewing machine. Safety Ball-Clutch mechanism prevents sewing machine from being damaged for over drive. and thick, as it can be regulated largely than feed dog by 20%. Productivity can be made great improvement by wiper mechanism for convenience of sewing, soft-touched back-tack button system and improved automize peripheral device such as advaced response and powerful back-tack solenoid which minimizes power loss. An extensive chip outlet with maximum 29.5mm width makes wide materials easy come forward and produce fast in any working circumstances. Also you can use it as a general lock-stitch sewing machine by covering the outlet when you don't need cutting. Durability with light weight special material of needle bar frame has a special structure to prevent oil leakage. With design of mes activating mechanism put into interior of arm, general sewing and exchange of cutting sewing are easy as working environments is simple and it contains excellent lever system enough considered clutch movement of knife up and down. among similar types of machine. Perfect and keen cutting ability for all kind of materials for cutting and with free adjustment to forward, back, left and right is satisfied various cutting out clothes condition and wide gauge condition. Also the structure of upper knife with special alloy materials and lower knife with needle plate attached tip of ultra light alloy that has an distinguished durability. sewing as well as for heavy thick materials. adjustment, assembly and disassembly procedures. The length of upper thread remaining in the needle after thread trimming is freely adjustable simply by simple adjustment of volume control in control box. Simple solenoid type structure does not require cable connection. 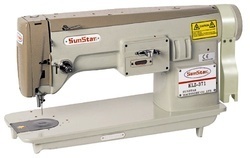 Constructed in block type upper feed movement structure, this machine demonstrates strong power in stepped sewing and even in heavy thick material sewing. The accurate movement of upper feed and gear action has eliminated puckerings and slip phenomena occurring on materials being sewn. Sensitive touch-button operation allows smooth reverse stitching as well as needle bar movement from top to bottom or vice versa. Work efficiency has been improved by installation of larger by 2.5 Fold-Capacity hook. Thread remaining in the bobbin can be verified easily through inspection windows installed on the right side of board. Damage to hooks caused by overload occurring during sewing operations is prevented with safety device of a ball-clamp type. Pressure control system operates as safety device by the simple bolt-adjustment. Knee lifting system not only operates smoothly, but raises the foot high. No extra knee lifting system installation is required on table. 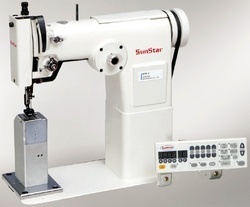 With the block-type upper feeding structure, it displays strong power during the sewing with thickness gap and the sewing for extremely heavy materials. The large pulley fitted for accurate needle position and control during the start and ending of sewing provides the highest efficiency for heavy fabric sewing, and the simple embedded synchronizer able to separate and adjust the pulley's up/down needle stop position individually. The accurate movement of the upper feed and the feed dog can resolve puckering and slipping problem depending on sewing materials. The simple touch of the reverse button enables the reverse sewing and the up/down movement of the needle bar. By extending length of the arm bed, wider working space can be secured for improved productivity. 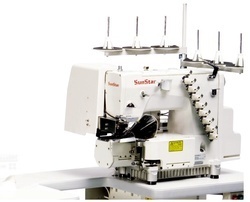 Powerful unison feeding mechanism,it guarantees stable and accurate sewing stitch quality. 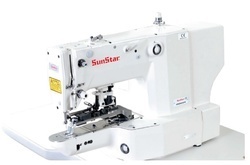 New, High Post sewing machine series developed through the advanced technology of SUNSTAR. 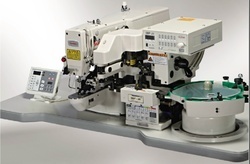 A new, higher level of advanced mechatronics has been ideally achieved by the grafting of the newly developed, automatic thread trimming Fortuna AC servo motor, equipped with the most up-to date function, to our new twin-needle sewing machine ; total integration of new, varied functions created for operational convenience. This new product will contribute greatly to upgrading variable of sewing pattern quality and to increased productivity. Superior anti-abrasive characteristics and high accurate knife operation. Simplicity of structure offers extremely easy adjustment, assembly and disassembly procedures. Belts can be changed without necessity of totally disassembling belt cover. Damage to hooks caused by overload occuring during sewing operations is prevented with safety device of a ball-clamp type. Long-lift moving and fixed knives can clearly cut even very thick threads. Knives can be easily disassembled, assembled and adjusted. Post structure makes for easy and accurate curve sewing within narrow confines. Sensitive touch-button operation allows smooth reverse stitching as well as needle bar movement from top to button or vice versa. Bed direct-connection type, smoothly operating knee lifting system. By developing lower shaft drive built-in motor type, minimize the contamination caused by the vibration and dust from V-belt. Also by applying fast and soft response, secure safe work environment. By securing the broad working area(width 335mm, height 148mm), increase work efficiency and enable to stitch big materials easily. Increase workability for heavy material through motion analysis(optimization of feeding element). Minimize shadow of sewing point by arranging LED at the front of needle bar. Increase productivity by reducing bobbin replacement during stitching with large hook (x2.5 capacity). Improve the function of thread trimming for various thread and the durability by installing reliable pneumatic cylinder mechanism. Expand sewing capabilitiy scope according to the thickness of fabrics by loading two main/auxiliary climb dials. Secure easy changing of stepped pulley for workers by installing the button for changing overlapping portion of presser foot and knee switch. Expand sewing capability scope according to the thickness of fabrics by loading two main/auxiliary climb dials. 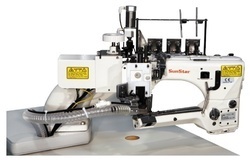 Install the stitch length changing button to secure easy stitch length changing capability for workers. Secure the 2-needle sewing capability such as joint sewing by applying ON/OFF button and loading pneumatic seam center guide presser foot. By securing the broad working area (width 335mm, height 148mm), increase work efficiency and enable to stitch big materials easily. fabrics by loading two main/auxiliary climb dials. Increase productivity by reducing bobbin replacement during stitching with large hook(x1.6 capacity). Minimize the contamination of sewing material with auto lubrication and coercive needle bar oil reflux by using oil pump.